Boosted by its success in helping students achieve social mobility, UC Santa Cruz jumped this year to among the top 30 public national universities, as ranked by U.S. News & World Report. UC Santa Cruz came in at No. 26, moving up from 33rd last year. The campus also ranked 70th among more than 300 national universities, up from 81st last year. For the first time, U.S. News and World Report’s ranking included social mobility among its measures, looking at both Pell Grant graduation rates and how they compare to all other students. Students receiving Pell Grants typically come from households that earn less than $50,000 annually. In 2017, the U.S. Department of Education released Pell Grant recipient outcomes for the first time, reflecting the entering 2010 cohort of full-time, first-time degree-seeking undergraduates. No California State University campus or member of the American Association of Universities had both a higher percentage of Pell enrollees and a higher Pell graduation rate than any UC campus, the UC system reported. At UC Santa Cruz, 48 percent of the entering class were Pell students and 77 percent of them graduated within six years. The campus received high marks for its diversity, as well, earning a spot on a list that looks at ethnic diversity at national universities. US News and World Report’s diversity index for UC Santa Cruz was .72—with closer to 1.0 meaning a student is more likely to run into students from a different ethnic group. In fall 2017, the undergraduate class of UC Santa Cruz was 28 percent Latino/a, 28 percent Asian; 4.2 percent African American, and .8 percent American Indian. 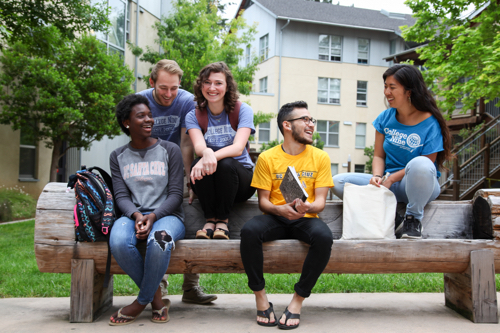 U.S. News and World Report also recognized UC Santa Cruz for its commitment to undergraduate education, putting the campus among the top 30 national universities. The ranking is based on what universities were cited most often by college presidents, provosts, and admissions deans. The campus ranked 37th on a list of best colleges for veterans. The appeal of UC Santa Cruz has never been stronger. Last year, the campus received more than 67,000 applications from high school seniors and community college students. The fall 2019 application is now open.